Previously released renderings of Riverfront Square, Newark. Full site rendering courtesy Lotus Equity Group. 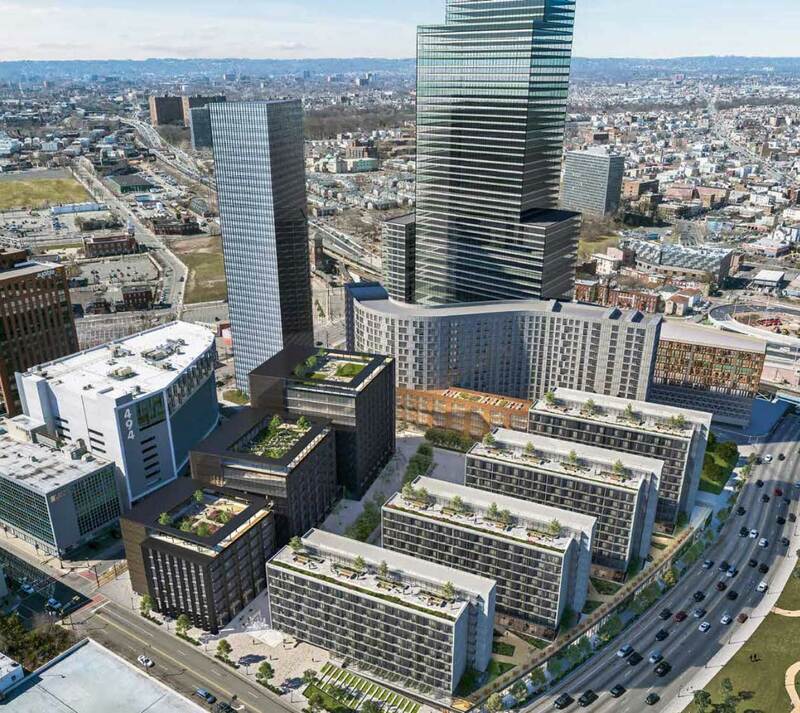 Newark’s municipal government has a redevelopment agreement on the books with the company behind a massive mixed-use development plan in the city. Now, Jersey Digs has obtained a copy. “The City believes the project…is in the best interests of the City and that it promotes the health safety, morals, and welfare of the City’s residents,” the agreement states. The project in question is the proposed Riverfront Square complex, which is expected to bring multiple buildings, parking garages, and pedestrian plazas to the site of the Newark Bears and Eagles Riverfront Stadium and the old Lincoln Motel property near the Newark Broad Street Station. A resolution authorizing the agreement with developer LEG 450 Broad Street, LLC was approved by the Newark Municipal Council back on October 30 and includes properties currently owned by the LLC, New Jersey Transit (NJT), and the Essex County Improvement Authority (ECIA). The LLC, which is registered out of the old Manhattan address of Lotus Equity Group, is planning to complete the development in seven phases and has been designated as the “exclusive redeveloper” of the project area. The Newark-based company is expected to construct and install any infrastructure improvements related to the project that the City deems necessary, according to the agreement. Benjamin Korman is listed as the Managing Member of the LLC while the other investors mentioned in the documents we obtained include Ja Han, LLC of Manhattan, Safika Properties PTY, Ltd. of Australia, Gencor Pty, Ltd. of Australia, and Ittai Realty, LLC of Manhattan. The “current concept design” as included in the agreement calls for Phase 1 to include between 700 and 750 apartments along with between 30,000 and 50,000 square feet of retail space. It would be located in the middle of the site. There would also be an optional 15,000 to 30,000 square foot performance venue that would depend on the ability to secure a tenant. Initially, in the Preliminary Site Plan, a 31,820 square foot performance venue was planned for Phase 1 along with 17 live/work units. Meanwhile, located along McCarter Highway near the train tracks, Phase 2 is expected to consist of a garage with up to 2,000 spaces. Phase 3 along Atlantic Street would include between 400,000 and 600,000 square feet of office space and plenty of retail space, while, closer to McCarter Highway, Phase 4 would feature between 550 and 600 apartments, between 25 and 35 live/work units, more retail space, and parking. At the northern edge of the old Lincoln Motel site, Phase 5 would consist of a massive high-rise with the bulk of the complex’s office space at up to 1.5 million square feet, along with 20,000 square feet of retail space and up to 1,000 parking spaces. Next door, a hotel with up to 300 rooms and a conference center would make up Phase 6. Lastly, in Phase 7, another high-rise near the Newark Light Rail tracks would include 500 to 550 apartments and additional retail space. Documents obtained from City Hall by Jersey Digs show that the developer now owns the old Lincoln Motel site at 422 Broad Street. NJ Parcels records confirm that the LLC bought the property from a company registered out of the same address as the Berger Organization in April for $12.5 million. In addition, the redevelopment agreement stated that the developer has entered into a separate exchange agreement with the ECIA that will allow the company to buy the existing parking garage on Bridge Street from the authority. As part of that deal, the ECIA would be able to “operate the same number of spaces” in one of the development’s new garages. The developer was expected to submit plans and apply for demolition permits for the stadium towards the end of 2018. Demolition is expected to be completed within one year after the permits are issued. Meanwhile, Phase 1 construction is expected to begin within four months after the footing and foundation permits are issued. It is slated to be completed no longer than three years later.